All Photos were Taken by Full Shine. Please also Be Noted about the Color Differences Because of the Different Light. 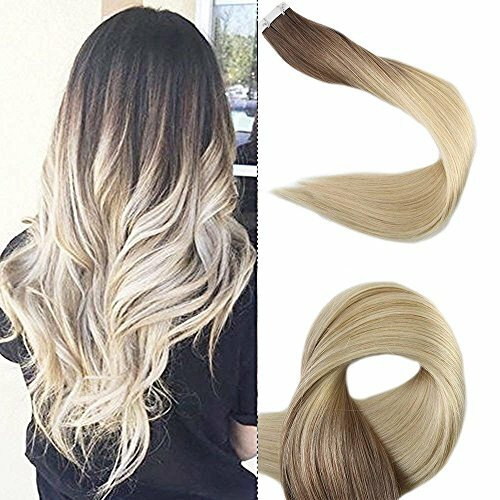 Products Name: Balayage Ombre Remy Tape Human Hair Extensions; Color: Dark Roots, Color #8 and #3 fading to #613 Balayage; Different Monitors Will show color a bit different; Length: 22"; Quantity: 20pcs/Pack; 50gram.40 to 80 pcs is suggested for a full head.Quality: Thick End but is not double drawn, Tangle Free Shedding Free. Please Be Aware of The Color Difference on Different Monitor. Unconditional Return and Refund is Accepted Within 15 Days After You Get The Item. Please Feel Free to Contact Us For More Details.